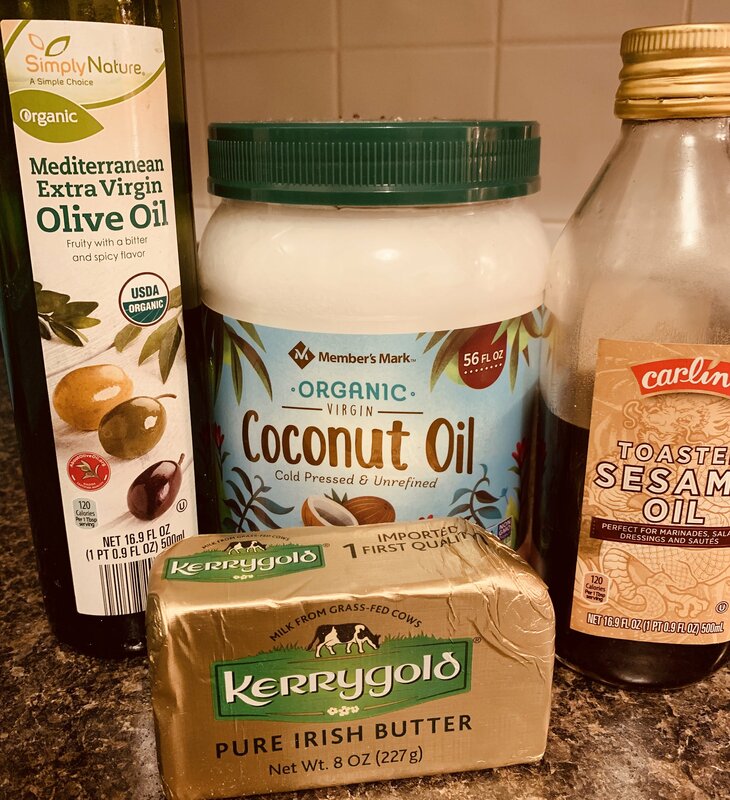 In this podcast, I talk about the different fats and oils I keep in my home and what I use them for. Olive oil comes in many grades. The three main grades are Extra Virgin, Virgin, and Olive Oil or Light Olive Oil. Extra Virgin is the first press of the ground olives. It does not have heat added. It is usually green in color and grassy and peppery in flavor. It is best to use this oil cold or at room temperature and not to heat it as heat will degrade the flavor of the oil. I like to use it for dipping bread or salad dressings. Virgin is usually the second or third press of the olives. It still has not had heat or chemicals added to extract the oil. It has less of the grassy and peppery flavors. I will occasionally use it to cook with but try to avoid super high heat as it oxidizes quickly. Coconut oil comes in two forms, refined and unrefined. It is a solid until about 75-76 degrees Fahrenheit. Unrefined Coconut Oil tastes like coconut. It has a high smoke point and is good for sautéing. I like to use it for stir-fry and hash browns. It does retain the coconut flavor, so it works really good with Asian flavored dishes. Refined Coconut oil is coconut oil that has been refined either with chemicals or heat. It does not taste like coconut and is good for high temperature cooking because it has a high smoke point. I keep three kinds of butter in my home, Unsalted butter, Salted Irish Butter, and Ghee. Unsalted Butter is conventional butter that does not have any added salt. I like to use it for baking. The reason I prefer unsalted is that different brands have different amounts of salt. In baking, it is easier to add salt to the recipe than to guess how much salt is already in the butter. Salted Irish Butter has a deep yellow color. I use the KerryGold brand. The cows in Ireland are grass fed and you can see that it changes the color of the butter. I find that it softens faster at room temperature and has a rich butter flavor. I use it to spread on toast or anything that need a pat of butter. Ghee is butter that has the milk protein solids and water removed. Butter is and emulsion of milk fat, milk protein solids and water. When you cook the butter gently, the water evaporates, and the milk solids fall to the bottom of the pot and eventually brown. This clarified butter has a high smoke point and works well when you want butter flavor but are worried that the butter will burn at the high temperatures. My simple salmon is best when cooked in ghee. 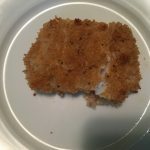 It allows you to get a nice brown crust on the fish which adds flavor and texture. You can find ghee near the other oils in the grocery store. It is shelf-stable but should be refrigerated after opening. I make my own following this recipe bye Foodie With Family. I keep toasted sesame oil in my refrigerator for Asian dishes. A little adds a depth of flavor. You want to keep it in the refrigerator because it oxidizes quickly. I use peanut oil for deep frying. In the summer we will deep fry once or twice a month. You can strain and re-use the oil 2-3 times. I like to keep it refrigerated after I have used it. It is important to start with neutral flavored things that won’t give the oil flavor. I like to start with donuts or French fries and fry fish or chicken the last time we use the oil. I don’t use this vegetable oil regularly in my home but have some in my refrigerator now because my daughter had to make a Gothic Cathedral out of gingerbread for a school project. She had a tight budget and it was much less expensive than butter. My mother uses margarine in many of her cookie recipes. It is key to getting the right texture in her cookies. My cookie recipes use real butter. I have a bottle of canola oil in my cabinet because my husband uses it on our document shredder as a lubricant. I don’t like to cook with it as it is highly refined and high in Omega 6 fatty acids. 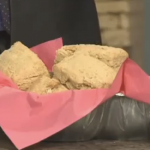 Many quick breads and muffin recipes call for vegetable oil. It gives the muffins a moist texture. Substituting butter in recipes developed with oil and five the baked goods a dry texture.